Four Avengers (Vision, Scarlet Witch, Goliath and Quicksilver) end up in a parallel dimension where they meet the Squadron Supreme (Nighthawk, American Eagle, Tom Thumb, Lady Lark, Hawkeye, Dr Spectrum, Hyperion and Whizzer) and battle the mutant Brainchild. The consciousness-controlling, billion-soul Overmind menaces the Fantastic Four but is defeated with the aid of Dr. Doom and the alien Stranger. The Sub-Mariner forms a brief alliance with the Hulk and the Silver Surfer to destroy a world-endangering weather device. Namor marries Lady Dorma but it is revealed that it was actually the vengeful Llyra in disguise. Sadly, Lady Dorma perishes saving Namor's life from Llyra's trap. Namor reunites with his father, Captain MacKenzie. Unfortunately MacKenzie dies when Llyra and Tiger Shark resurface. Kang the Conqueror sends the Hulk back to WW I where he meets the air-ace Phantom Eagle. When the Sandman uses Betty Ross' blood to expunge his radiation sickness, Betty is turned into glass. Between the technology of Reed Richards, Charles Xavier and Tony Stark, the Hulk is subdued. He is promptly captured by the ancient insect-like Psyklop, who shrinks the Hulk into a sub-atomic world where he meets and falls in love with the green-hued Princess Jarella. Unfortunately his peaceful stay in the micro-world is cut short when he is retrieved by Psyklop. Psychiatrist Dr. Leonard Samson cures Banner of the Hulk, but uses residual gamma radiation to turn himself into a superhuman "Doc Samson". Banner becomes jealous of the attention Samson gets from Betty Ross and becomes the Hulk again. The Enchantress changes Samantha Parrington into the Valkyrie to harass the Hulk at a "radical chic" fundraiser. Thor, Loki, Karnilla and the rest of Asgard resist apocalypse at the hand of Infinity, a corrupted specter of Odin, created by Hela, the Goddess of Death. Hela walks the Earth in pursuit of Thor's living soul. Iron Man encounters a new criminal mastermind determined to destroy Stark Enterprises, the Spy-Master. Iron Man, Madame Masque, Daredevil and Nick Fury fight the evil influence of the alien Zodiac Key. Kevin O'Brien dons Stark armor and becomes the Guardsman. Later he becomes jealous of Tony and is killed while working for a Stark competitor. The Sam Wilson, as the Falcon, becomes Captain America's partner. Steve Rogers joins the NYPD as an undercover SHIELD agent to investigate disappearing officers. The Red Skull attempts to invade Dr. Doom's nation of Latveria. 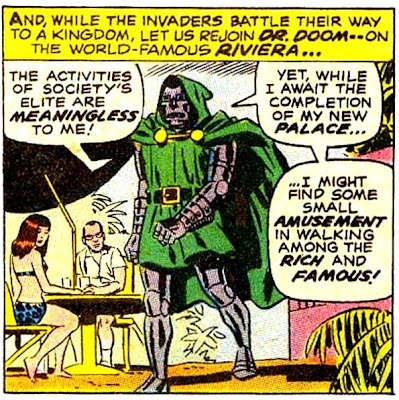 Doom in turn invades Wakanda for its vibranium, but is discouraged by the Black Panther. While Spider-Man battles the Green Goblin, his son Harry Osborne gets hooked on drugs. Peter takes a drug which he thinks will take away his spider powers, but instead grows four extra arms. Looking for a cure, Peter meets (Michael) Morbius, the Living Vampire. The Lizard surfaces and using Morbius' blood, cures Peter of his extra arms. Dr. Strange ends his retirement and forms the Defenders (w the Sub-Mariner and the Hulk) to save Earth from the other-dimensional scientist Yandroth. The Black Widow enters Daredevil's life when she aids him against the Owl and the Scorpion. They soon move to San Francisco for a time. 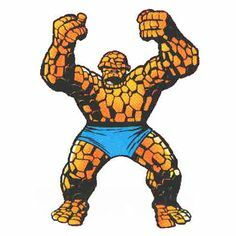 The Man-Thing is created when scientist Ted Sallis injects an unstable "super-soldier" serum into himself and falls into the Nexus of All Realities, hidden in a Florida swamp. Rick Jones uses Reed Richards' Baxter Building portal to free Captain Mar-Vell from the Negative Zone. Ronan the Accuser seizes control of the Kree Empire from the Supreme Intelligence. Ronan captures Mar-Vell and the Avengers in the Arctic and unleashes a plan to de-evolve all human life. However the Kree-Skrull War becomes active and Ronan abandons his mission when the Skrulls invade Kree space. Wanda reveals feelings for the Vision. H. Warren Craddock, a disguised Skrull, turns the public against Mar-Vell and the Avengers. The Avengers are tricked into disbanding. The Super-Skrull (disguised as Carol Danvers) kidnaps Mar-Vell, Wanda and Quicksilver. The remaining Avengers recapture the three Skrulls previously defeated by the Fantastic Four in 1962. The Super-Skrull is able to find the Inhumans' Great Refuge and attempts to destroy the Kree-related race's home - but fails. After being taken to the Skrull home-world, Mar-Vell is forced to begin developing an Omniwave weapon for the Skrull Emperor. The Avengers journey to the Inhumans’ Great Refuge and disrupt Maximus' plan to aid Ronan's Kree rebel forces. Rick Jones is captured by a fleeing Kree ship and taken to Ronan. The Skrulls desire to use Earth as a stepping stone to Kree space. Thor, Iron Man, Vision, Goliath and Captain America engage the Skrull space-fleet in near-Earth space. When the battle goes badly for the Skrulls, the Skrull Emperor sends a planet-destroying missile towards Earth, with Goliath in pursuit. Mar-Vell, still on the Skrull home-world, uses the Kree Omniwave to contact Rick Jones but the energy instead releases latent reality-altering powers (which the Supreme Intelligence claims are humanity's racial birthright). Rick uses this power to immobilize both Ronan's Kree forces and the Skrull fleet. He and Mar-Vell are forced to re-combine in order to contain the new power. 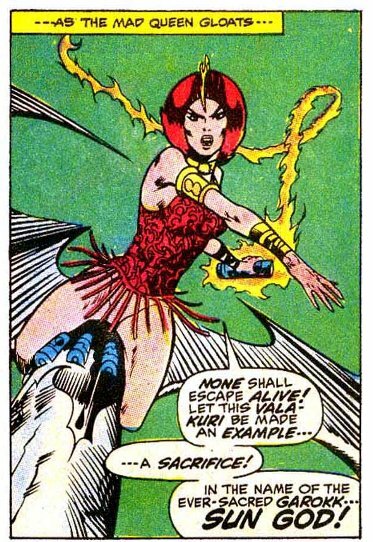 The Kree Supreme Intelligence and the Skrull Princess Anelle take control of their respective empires.